Space under my grow lights is really limited – I start a lot of seedlings and have just three shelves with lighting. One of the ways I make this work is by filling an entire flat (without cells) with dirt, and spreading seeds through the whole thing, or seeding three seeds in a cell, then later dividing them, and moving them to bigger pots. 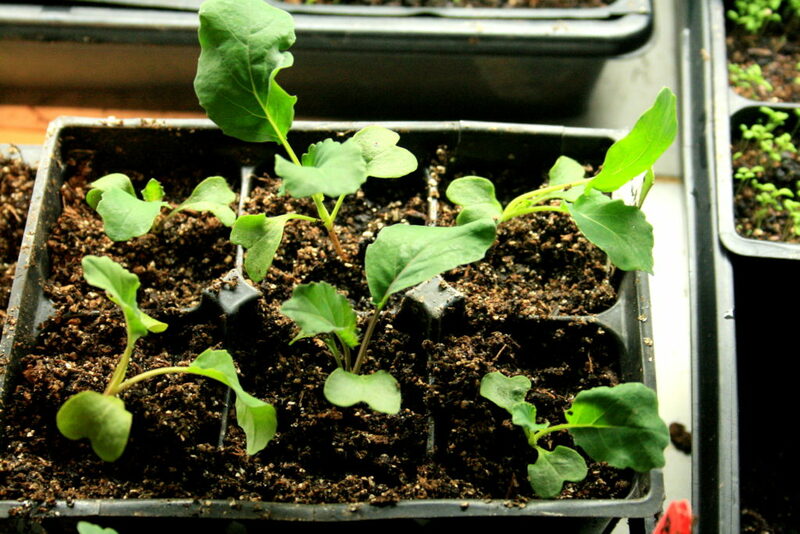 Once the starts are in bigger pots, it is hopefully warm enough to move them out to the small, unheated greenhouse. This is a huge relief valve for the constant dance of seed flats, heat mats and lights going on during the months of March and April. Moist soil – If your soil is dry while working with the plants, you will just end up tearing the roots right off one of the seedlings. Water your seed flat before working. Divide when plants are young – The easiest time to pluck seedlings out of flats or divide plants is when they have just put out their first set of true leaves. The roots are small yet, so not very tangled. Water dunk and massage – If your seedlings are more mature and the roots are really tangled, moist soil won’t be enough. You can take the whole root bundle, immerse it in a bucket of water. This will rinse away lots or all of the soil, and the roots will be more forgiving. Gently massage the tangle until the plants are separated. 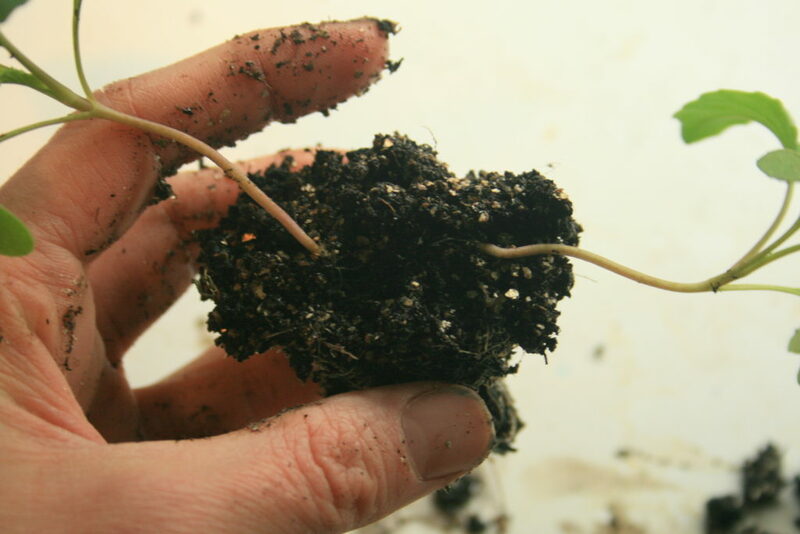 Take as much root as possible – Ideally, you would divide and keep all of the plants’ roots attached to the stem, but this isn’t always possible. It really won’t hurt the plant too much if they lose some of their roots. I have had some seedlings survive unhindered with just a little hair of their roots surviving the divide. There are a select few plants that don’t do well with root disturbance, but for most of what you will start indoors, they are very resilient to the tugging and pulling. Assess the stems – Before you start pulling at the clump of plants, part the foliage and look at the base of the stems. Notice where each plant is coming up from – they often cross each other and grow on the opposed side as their roots are. Pull them apart according to the side that their stem comes up from to ease the friction. Tease apart gently – Pinch the clump in several places to loosen the clump up. Hold at the top of the root mass, or just below the stem, then pull gently. Lay it flat to work it, if that helps. Push your fingers into the roots to tease them apart if they don’t come by gently pulling. 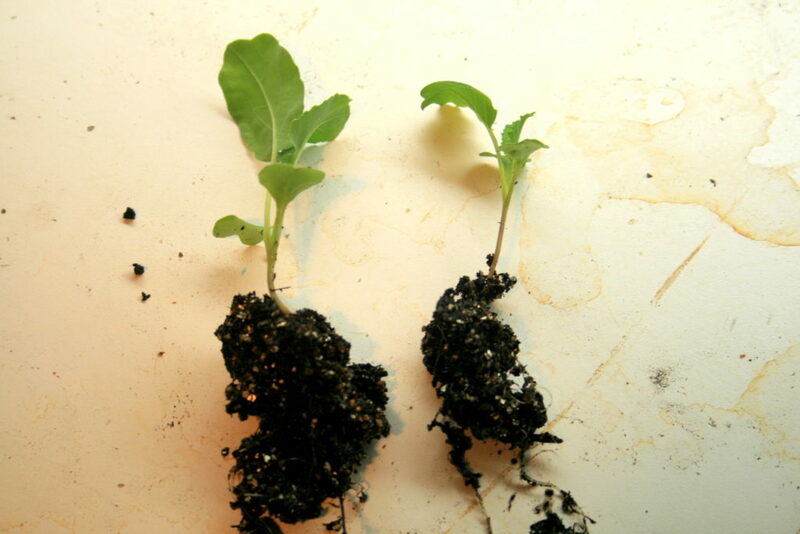 Bury extra stem – If the lights are too high up or plants were overshadowed by bigger plants, the seedlings become leggy. 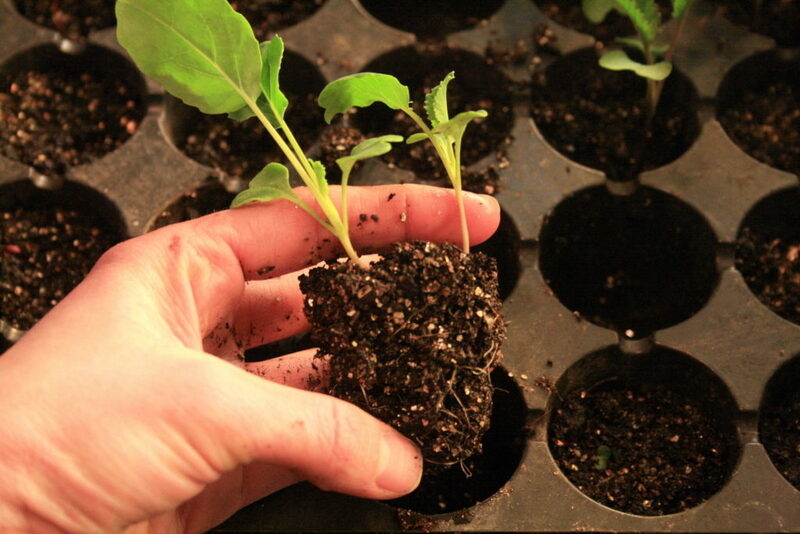 Transplanting is a chance to give them more space, and a better standing. Make your hole deeper, and bury the extra stem. 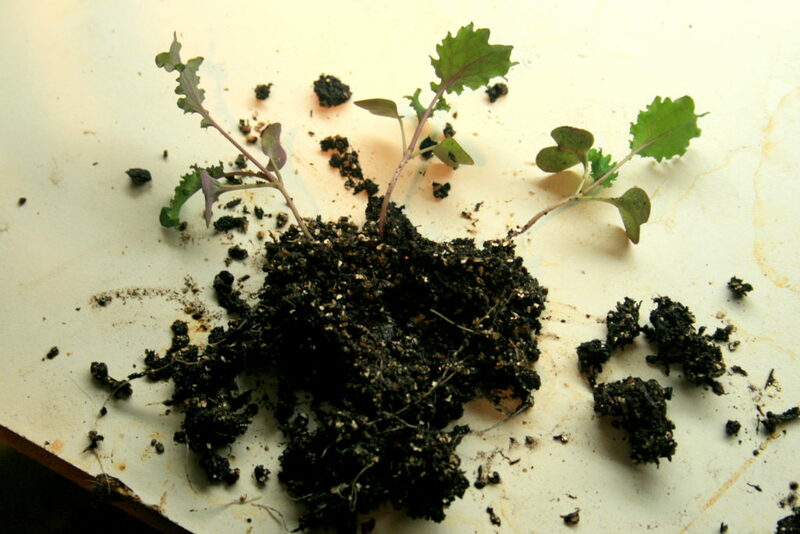 The base of the plant will be much stronger to stand upright under the lights, and it some cases (like tomatoes), roots will begin to grow from the buried stem. The roots aren’t too big yet; this will be an easy divide. Notice which side each plant is growing from by looking at the base of the stems. 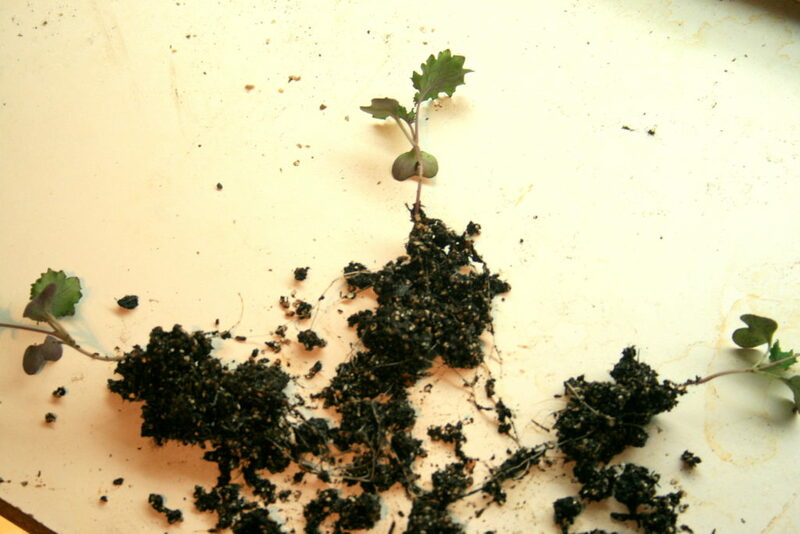 In this case I was able to just gently squeeze the soil clump apart. Now I have two healthy cauliflower plants! This clump had three kale plants growing together. With really moist soil and laying it out flat, it was easy to see where the roots for each plant were at, and to tease them apart accordingly. All the plants received much larger containers that will hopefully hold them over until all that snow melts and I can put them in the ground! 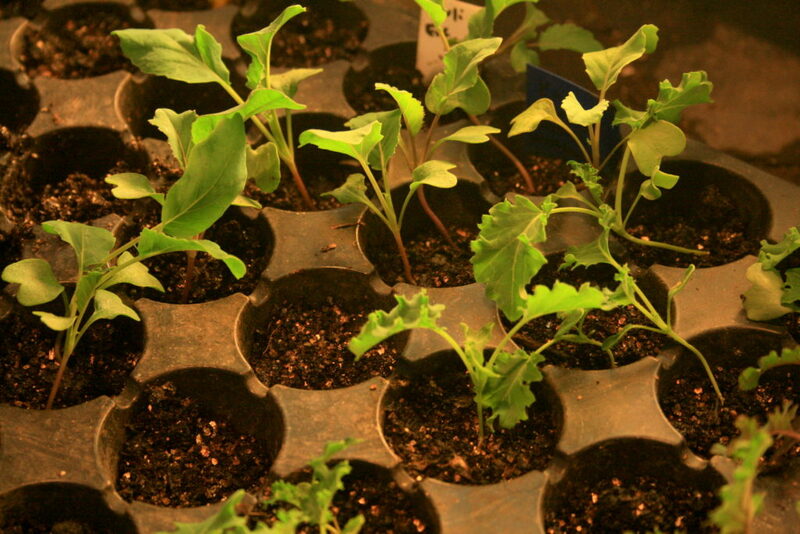 The plants will look a little floppy or tired after transplanting them to larger containers. Just put them back under the lights or in a greenhouse. They will perk right up as they stretch for the light! The forecast here for Minneapolis is looking much better than it had been this past week! I’m hoping that at least the brassicas will go out to the greenhouse in a couple days and it won’t be long before they can go in the ground.